RM Tools – What Are They Anyway? There is time for a new class of requirements tools. Those do not only support classical requirements management, but also requirements activities, that help to improve the collective understanding of requirements through illustration and collaboration and therefore ultimately serve to build better products. There are quite a few requirements management (RM) tools out in the market. Did you ever wonder what qualifies them as an RM tool? This question is of specific interest, when you are in the process of selecting a requirements management tool for your organization. A good starting point for the evaluation of tools is to get insights about your driving needs. What should the tool do for you? The latter situation is better, because it is always helpful working towards your own goals. What is it that you want to accomplish? If you know this, then you get a clear guidance what are the most important features of any given tool for you. The statement “support the RM process” is more tricky and interesting to explore. That provides a great start. We now have some objective criteria to check whether a tool can call itself a requirements management tool. Comment: Will Microsoft Word qualify as RM tool? But, we aren’t done – these are just the basics. When we look at the feature lists of prominent “RM Tools” we will notice, that vendors typically provide a much richer set of features. There are several reasons for that. On one side rich feature sets are business differentiators. If product A provides “killer features” that other products don’t have, it will have some competitive advantage for the company who sells A. 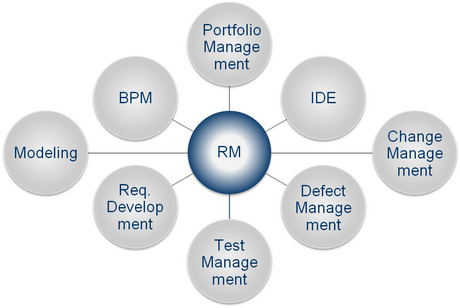 On the other side a rich feature set for RM may also be rooted in the nature of the requirements management process. Being a central part of product development, requirements management has many interfaces to adjacent processes and tools. Tool vendors have the option to either provide interfaces to the adjacent processes or incorporate support for these adjacent processes directly in the tool. Especially products, that are out in the market for quite some time, often show the latter approach. In recent years the term “Application Lifecycle Management” (ALM) became prominent. It is used in situations where a tool provides support for several (or all) phases in the application lifecycle. While this may suit some companies it imposes challenges too. Often companies have already deployed tools in adjacent areas and are then forced to evaluate what tool solution should be used going forward. Therefore, ALM in a single tool may only be beneficial for some companies. When requirements aren’t that clear often visualizations help to move forward. In recent years more and more tools offer visualization features for requirements representation. This may range from support for rich media formats like pictures and movies, to support for sketches, storyboards, mockups and finally to support for modeling activities with varying degree of formal notations. An optimal complement to visualization concepts are collaboration features. Requirements engineering demands interaction between stakeholders. Fortunately the trend to social media software has also spread to the requirements tools market. Use of social media functionality improves requirements understanding and reduces the risk building the wrong product. This is a great advance in requirements engineering. In summary, I believe that there is time for a new class of requirements tools. Those do not only support classical requirements management, but also requirements activities, that help to improve the collective understanding of requirements through illustration and collaboration and therefore ultimately serve to build better products. Watch out for these type of tools when selecting a requirements tool. Next Next post: What Software Tools Support Requirements Management?